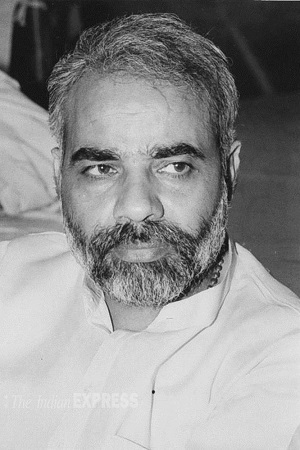 Shri Narendra Damodar Das Modi is the 14th serving Prime Minister of India and Member of Parliament representing Varanasi. He served as the Chief Minister of Gujarat for 13 years from 2001 to 2014. He is popular for taking bold and firm steps of reforms. At the age of 8, he became a member of Rashtriya Swayamsevak Sangh (RSS). In 1971, he became a lifelong member of RSS. He has a Postgraduate degree in Political Science. In 1985, he became a member of the Bharatiya Janata Party (BJP). Between 1985 and 2001, he assumed many important positions in the BJP and took various responsibilities within the Party. He became 14th Chief Minister of the State of Gujarat in 2001 and subsequently got elected as the Chief Minister. From 07 October 2001 to 22 May 2014, he served as the Chief Minister of Gujarat and became the longest-serving CM of the State. During his tenure as the CM, he launched many beneficiary schemes and programme such as Panchamrit Yojana, Sujalam Sufalam Yojana, Krishi Mahotsav, Chiranjeevi Yojana, Matravandana, Beti Bachao Yojana, Jyoti Gaman Yojana, Karmyogi Yojana, Kanya Kalavani Yojana, Awaas Yojana, Bal Bhog Yojana, Van Bandhu Vikas Yojana amongst many. 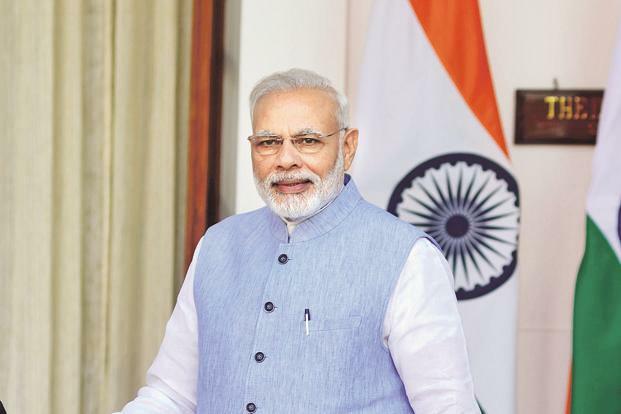 On 13 September 2013, his name was announced as the BJP's Prime Ministerial candidate for the 2014 general elections and on 26 May 2014, he was sworn in as the 14th Prime Minister of India at the Rashtrapati Bhavan. During his tenure of Prime Minister, Narendra Modi has successfully implemented many humongous schemes like Jan-Dhan Yojana, Awas Yojana, Mudra Yojana, Ayushman Bharat, Saubhagya Yojana, Ujjwala Yojana, Swachh Bharat, Make in India, Digital India, Mission Indradhanush and tax reforms (GST). Rising sign or ascendant in his birth chart is Libra, and the ruling planet (Lagna lord) Venus is placed in Labha Sthan or eleventh house. The Moon is debilitated and is placed in the Dhana Bhav or second house. Mars is placed in its own sign and conjuncts the Moon in the Dhana Bhav. Exalted Mercury is placed in its own house and conjuncts with Sun, South Node (Ketu) and Neptune in the Vyaya Bhav or twelfth house. A combust Saturn is in conjunction with the ruling planet Venus in the Labha Sthan. The ruling planet Venus is Vargotami, i.e. 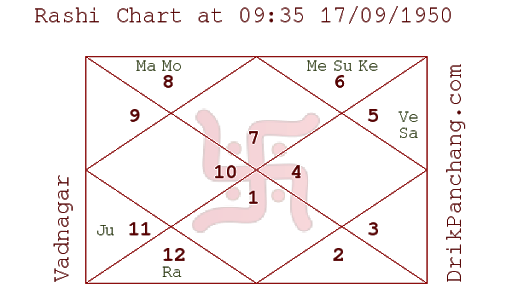 is placed in the same sign in the birth chart as in Navamsha chart. 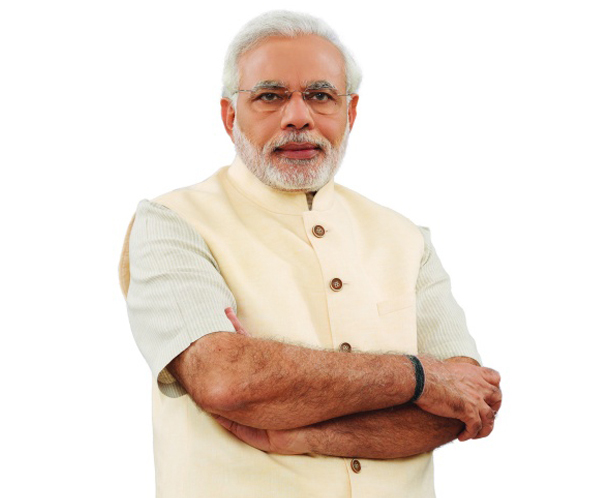 Kundali of Shri Narendra Modi is full of many auspicious Yogas or planetary aspects and conjunctions. Ravi Yoga, Gajakesari Yoga, Poshi Yoga, Budhaditya Yoga, Shankha Yoga, Bheri Yoga, Parijata Yoga, Lakshmi Yoga, Varishtha Yoga, Rajyoga, Dirghayu Yoga, Buddhishali Yoga, Bhagyashali Yoga, Kedara Yoga, Kemdruma Bhanga Yoga, Saphala Amala Kirti Yoga, Papkartari Yoga, Neechabhang Rajyoga, Kenu Trikona Yoga, Vimala Yoga, Dhana Yoga, Swavirya Dhana Yoga, Karmjeeva Yoga, Garuda Yoga, Dehasthulya Yoga, Sumukha Yoga, Bhatravraddhi Yoga, Prakram Yoga, Bandhupujya Yoga, Matradirghayu Yoga, Matrasneha Yoga, Vahana Yoga, Bhagya Yoga, Satkirti Yoga, Arishta Bhanga Yoga, Purnayu Yoga, and Chatushrachakra Yoga. The conjunctions like Akriti-Vapi Yoga, Moon-Mars aspect, Madhyayu Yoga, physical disability Yoga, and Venus-Saturn aspect may affect you both negatively and positively. There are some inauspicious planetary conjunctions also present in his Birth Chart. However, if auspicious conjunctions are stronger, they have the power to mitigate or completely negate the influence of inauspicious conjunctions from the person's birth chart. The inauspicious conjunctions are Kemdruma Yoga, Nirbhagya Yoga, Visha Prayoga Yoga, Vanchan Chora Bhiti Yoga, Deh Kasht Yoga, Krasanga Yoga, Paranna Yoga, Arishta Yoga, Daridra Yoga and Arishtamati Bhrama Yoga. 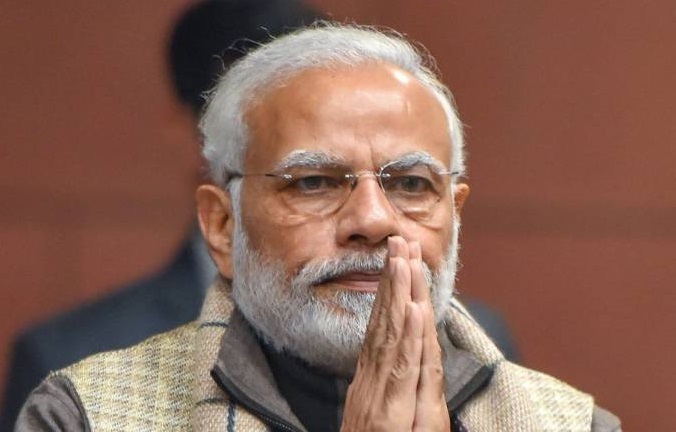 What does Birth Chart of Narendra Modi say about the 2019 General Elections? Currently, a Moon Mahadasha (prime planetary period) is going in his chart that began on 12 February 2013 and will end on 12 February 2023. Furthermore, there will be a Mercury Antardasha (sub planetary period) from 13 Decemeber 2018 to 14 May 2020. As the Mercury is making a favourable aspect with Moon in the eleventh house, it suggests start and gains of many auspicious happenings in his life like position, honour, fortunes, and happiness. Additionally, exalted Mercury also suggests many propitious circumstances that will bring unprecedented joy and success in his life. A Venus Pratyantardasha (sub planetary period) will begin from 27 March 2019 and end on 21 June 2019. From 17 July 2019 to 29 August 2019, there will be a Moon Pratyantardasha (sub planetary period). These auspicious periods may turn the tides in his favour if the election date is announced or election falls within the aforementioned dates. A study of planetary transition in his chart gives an understanding of how Jupiter will influence his life in the coming months. Jupiter stays in the same sign for a long time, and currently, it is in Scorpio since the beginning of 2019 and is positioned in the first house of his Moon Chart. From 29 March 2019, Jupiter will begin the transition and enter into Sagittarius. From 23 April 2019, the Jupiter will retrograde and enter into Scorpio and from 05 November 2019; it will again enter into Sagittarius. This transition of Jupiter will evoke unfounded fear and cause dislocation and digression from the path or objective, enhance unnecessary expenditure, force injudicious decisions and increase the number of sweet enemies. However, Jupiter in the retrograde will influence you positively and will bring propitious prospects. Saturn will remain in the same position that is the second Sign in his Birth Chart all through the year. In other words, the Saturn Sade-Sati is in the last phase which means there will be Saturn's Silver-Paya in his chart which indicates increased influence and authority. Rahu or North node is in the Cancer sign in his chart which is the ninth place from his sign which indicates some negatives and unfavourable time ahead. From 07 March 2019, Rahu will enter the eighth sign in his chart. The transition of Rahu into the Gemini also indicates tough times ahead. Questions needed to be answered? What are the planetary position, aspects, and conjunctions in the Birth Chart of his opposing candidate? What would be the election date and the planetary transition on that very day in the Moon chart? 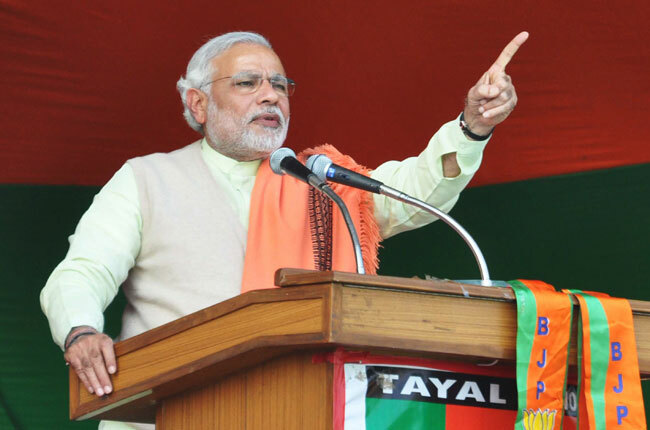 Will Narendra Modi reassume the office of India's Prime Minister? Future holds the results of the 2019 general elections, so wait until then. Shri Narendra Modi chart posses all the auspicious planetary conjunctions and aspects, the Mahadasha-Antardasha-Pratyantardasha of Venus and Moon also indicate propitious time ahead and favourable prospects. But to predict anything regarding the upcoming general elections, the exact date will be needed as the planetary transition of that very day will play a considerable role in the results of the election. We will update our analysis after decalration of 2019 general election date. There is a beautiful proverb about Ramayana which tells that even the great saint like Vashishtha couldn’t foretell the future of Lord Rama when he completed all the preparation of Lord Rama’s coronation oblivious of the fact that the very next day, Rama will be sent to his 14-year exile.